Intestinal bacterial overgrowth has been shown to increase the risk of coronary artery disease. The good news is there may be a simple way to protect against this by utilizing probiotics which have anti-bacterial overgrowth effects. Let’s elaborate. So small intestinal bacterial overgrowth (also known as SIBO) can be one cause of the symptoms of IBS. Gas, bloating, abdominal pain, constipation, and diarrhea being the most notable. And there may be, as this study is suggesting, a connection between SIBO (small intestinal bacterial overgrowth), your gut, and heart disease. SIBO-positive patients were compared to SIBO-negative patients. SIBO was found to be associated with Coronary Artery Disease (CAD) and with the number of coronary arteries involved in this study. Further studies are necessary to confirm the association of SIBO with CAD. In the presence of risk factors, patients with SIBO may benefit from assessment for CAD. Multi-strain probiotics are beneficial in lowering cholesterol. The inclusion of L. acidophilus appears to be important in the blend. Probiotics have been shown to be able to combat and decontaminate or clean out SIBO. Get help with heart disease. DrMR: So let’s go through some of the details. A total of 1059 patients were tested for SIBO and via coronary artery angiography—so essentially getting an assessment of the health of the coronary arteries. And their results were quite striking. Coronary artery disease was detected in essentially 80% of those with SIBO compared to essentially 40% of those without SIBO. So that’s a very significant jump. It’s essentially a doubling of risk. And there was also an increased prevalence of diabetes, chronic kidney disease, blood pressure lowering agents and cholesterol lowering agents in the patients with SIBO compared to the patients without SIBO. Essentially, what that means is the researchers were trying to separate out for if the diabetes or the kidney disease or the use of high blood pressure lowering agents because one had high blood pressure or cholesterol lowering agents because one had high cholesterol were the reasons that the people with SIBO had the decreased health of their coronary arteries. And what they found was that even after isolating all those variables out and controlling for just the association between SIBO and coronary artery disease, SIBO was still a significant contributing factor to the decreased health of coronary arteries. So that’s, I think, another area where we are seeing the gut have such a far-reaching effect to many systems of the body, in this case, your cardiovascular system. Now, I want to tie this in with probiotics. We’ve covered—and I’ll put a few links in here. And we know that a few high-level scientific analyses have been done showing that probiotics have the ability to lower cholesterol. 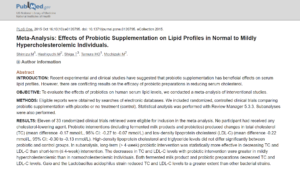 There have been a number of trials showing that probiotics—and namely Lactobacillus acidophilus may be one of the more important ones—can lower cholesterol levels. But there’s more to heart disease than cholesterol. And I want to make an important tie-in for how probiotics may—and this is speculative—may help with heart disease. And quite simply, probiotics have been shown to be able to combat and decontaminate or clean out from the small intestines, small intestinal bacterial overgrowth. So if you take a probiotic, that is one way of addressing and correcting small intestinal bacterial overgrowth. So there may be more than just the ability of probiotics to lower cholesterol. It may be because probiotics can clean out SIBO that they may have a potential benefit for heart disease. And I also wanted to draw a connection between your heart, your coronary arteries, and your gut. We know that an independent risk factor for heart disease is inflammation. And we know one of the main instruments used by your immune system is inflammation. Or the immune system is one of the predominant reasons for having inflammation released in the body. And we know that the largest density of immune cells in your entire body resides in your small intestines. So small intestinal bacterial overgrowth, this is where the bacterial overgrowth will be essentially interfacing with the immune system in the small intestine. And that’s not a happy, harmonious relationship. And that high density of immune cells will be likely reacting, causing inflammation. And inflammation is an independent risk factor for heart disease. So some of these connections here, some of these inferences, have yet to fully be proven. But that certainly is a mechanism that I think is plausible. So we’ve talked about the association, at least according to this one study, between coronary artery disease and small intestinal bacterial overgrowth. We’ve discussed how probiotics can lower cholesterol and how probiotics can be a treatment for small intestinal bacterial overgrowth. And we’ve talked about the connection between your heart (or said more definitively, more specifically, coronary artery disease) and your gut via the immune system and inflammation as the connecting piece. Now, there are a couple counterpoints here I should point out before we get too carried away with the potential utility of the gut-heart connection. And that is, we don’t really have good outcome data showing that interventions that improve one’s gut health will decrease the incidence of coronary artery disease. So there’s more here to be documented. Would improving your gut health in any way harm your heart? I very much so doubt it. I would only be inclined to think as long as the intervention for the gut was reasonable and low risk, something like probiotics, a low FODMAP diet, what have you, that you would only stand to gain from that. Also, IBS (irritable bowel syndrome)—abdominal pain, altered bowel function, constipation, diarrhea, bloating—has not been shown to increase, at least to the best of my knowledge, the incidence of heart disease—heart attack, stroke, coronary artery disease, cardiovascular episodes. So that’s a good thing. But it also may be a bad thing. It may also indicate that even if one improves their IBS, there may not be any spillover benefit to one’s heart health. However, I think it’s prudent to say that improving the health of your gut may give you benefit for your heart and certainly has no downside as long as you’re using noninvasive therapeutics to that endpoint. So this is very interesting. We’re seeing a connection between the coronary artery health (obviously very important) and small intestinal bacterial overgrowth, the gut. And hopefully, this information will motivate you to take your gut more seriously. And this information will also help you get healthier and get back to your life. Thanks much for your generous information. So, probiotics for SIBO which are often sited as a contraindication for there use. Interesting. I started taking and recommending a probiotic with phage combination figuring that if the phages are only targeting pathogenic bacteria, what have you got to lose. Have you heard of Bemer Therapy? I have been using this PEMF for over a yr and half – and I put this belt / wrap over my gut daily which creates blood flowr and microcirculation. This medical device 1 FDA approved, has 5 patent signals. This technology is being used by NASA for the astronauts space suits. I believe everything you say or suggest about the gut. I use this medical device for all areas of my body. Lay on the matt for 8 min 2 x a day! Just wanted to see if you have investigated or know about this as it may be something for you to look into. Go to pubmed.gov bemer I think you will be impressed with it’s benefits.